RAYMOND S. IWAMOTO practices as a transactional lawyer, handling complex real estate and business transactions. He is a Fellow of the prestigious American College of Real Estate Lawyers and served a three year term on its Board of Governors. He has been listed in the Best Lawyers in America, Chambers USA America’s Leading Lawyers for Business, Superlawyers, and the International Who's Who of Real Estate Lawyers. He is listed in the 14th Edition of Who's Who Legal: Real Estate 2017 as one of the leading real estate practitioners in the United States. He represents local, national and international developers, land owners, financial institutions and individuals engaging in diverse real estate and business acquisitions, development and real estate financing in Hawaii. He has been engaged as an expert witness in real estate litigation. 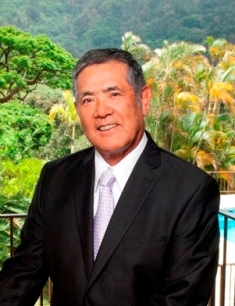 Mr. Iwamoto was born and raised in Honolulu, Hawaii, and graduated from McKinley High School. He is a former U.S. Army Captain, Medical Service Corps., a Vietnam war veteran and a former State Judge Advocate General for the Hawaii Army National Guard. Faculty Member ALI-ABA Courses of Study Resort Real Estate and Clubs (2005); Lorman Education Services in Real Estate Finance, Real Estate Closings and Contracts and in Advance Topics in Hawaii Real Estate Law and National Business Institute on Commercial Leasing; a participant in the invitation-only Georgetown University Law Center Advanced Commercial Leasing Institute; former chairman of the Hawaii State Bar Association’s Real Property and Financial Services Section; a member of the American Bar Association, Section of Real Property, Probate and Trust Law; a member of the “Blue Ribbon Condominium Re-codification Committee” of the Real Estate Commission of the State of Hawaii; a member of the editorial board of the American Law Institute - American Bar Association; and Co-Chair of the Hawaii Bar Association's "Committee for Plain Language Conveyancing." "Hawaii Local Counsel Opinion," Hawaii Bar Journal, November 2016; "Construction Defects and 'Occurrence' under the Commercial General Liability Policy," The Practical Real Estate Lawyer, July 2015 issue, Vol. 31, No. 4; "My Hotel Deserves a Brand, But What If I Want to Terminate the Brand? ", published in and presented to the American College of Real Estate Lawyers, Spring 2014, Island of Kauai, Hawaii, and published in The Practical Real Estate Lawyer; "Partnership Disputes: Marquis of Queensbury Rules?" American College of Real Estate Lawyers (ACREL) News, August 2011 issue, Vol. 29, No. 3; "The Uninsured Risks of Development (Part 2)," The Practical Real Estate Lawyer, July 2011 issue, Vol. 27, No.4; "The Uninsured Risks of Development," The Practical Real Estate Lawyer, January 2010 issue, Vol. 26, No.1; Contributing Author of the Commercial Real Estate Transactions Handbook, Fourth Edition, Mark Senn, Editor, published 2009 by Aspen Publishers; Contributing Author of Foreclosure Law and Related Remedies, Second Edition: State Chapter Bundle B, published 2009 by the American Bar Association; "Legal Aspects of Condominium and Homeowners' Associations," Lorman Education Services Seminar, March 2008, Honolulu, Hawaii; "Chapter 514B Hawaii Revised Statutes - New Condominium Law in Hawaii," New Condominium Law in Hawaii, V. II, p. 397, Lorman Education Services Seminar, January 2007, Honolulu, Hawaii; "Hotel Operator's Agreement With The Owner's Lender (With Forms)," The Practical Real Estate Lawyer, September 2006 issue, Vol. 22, No. 5; "Chapter 514B and the Interstate Land Sales Full Disclosure Act, Binding Contracts and Consumer Protection," New Condominium Law in Hawaii, Hawaii State Bar Association Seminar, May 2006, Honolulu, Hawaii; Condominium Hotels and the Securities Act of 1933 power point presentation presented to the American College of Real Estate Lawyers Spring 2006, Kiawah Island South Carolina; "Condominium Hotels," The ACREL Papers Spring 2006; “Insurance and The Commercial Lease (Part 1 and Part 2)," The Practical Real Estate Lawyer, January 2006 issue, Vol. 22, No. 1 and March 2006 issue, Vol. 22, No. 2, respectively; "Mezzanine Financing," Lorman Education Services Seminar, February 8, 2005; "Contract Considerations in Real Estate Transactions in Hawaii," Lorman Education Services Seminar, October 6, 2004; "Fundamentals of Real Estate Closings in Hawaii," Lorman Education Services Seminar, March 3, 2004; Contributing Author of the State-By-State Guide to Commercial Real Estate Leases, Mark Senn, Editor, published 2004 by Aspen Publishers; “How to Handle Operating Expenses and Gross Up Clauses (with Sample Clauses),” The Practical Real Estate Lawyer, January 1999 issue, Vol. 15, No. 1; "Counseling the Client on Third-Party Opinions," The Practical Real Estate Lawyer, March 1995 issue, Vol. 11, No. 2, and ALI-ABA's Practice Checklist Manual on Advising Business Clients; "Using Insurance in Commercial Leases," The Practical Real Estate Lawyer, May 1994 issue, Vol. 10, No. 3, and ALI-ABA's Practice Checklist Manual For Drafting Leases II; "Using Insurance in Commercial Leases," The Practical Real Estate Lawyer, May 1994 issue, Vol. 10, No. 3, and ALI-ABA's Practice Checklist Manual for Drafting Leases II; "Wetlands," The University of Hawaii, Hawaii Real Estate Research & Education Center's article (1991); "Borrower's Counsel's Opinion Letters to Lenders," Hawaii State Bar Journal 129 (1987) article.